NY Design Week officially came to a close last week, but that doesn’t mean we’re done marveling over our favorite student work seen at NYCxDesign. 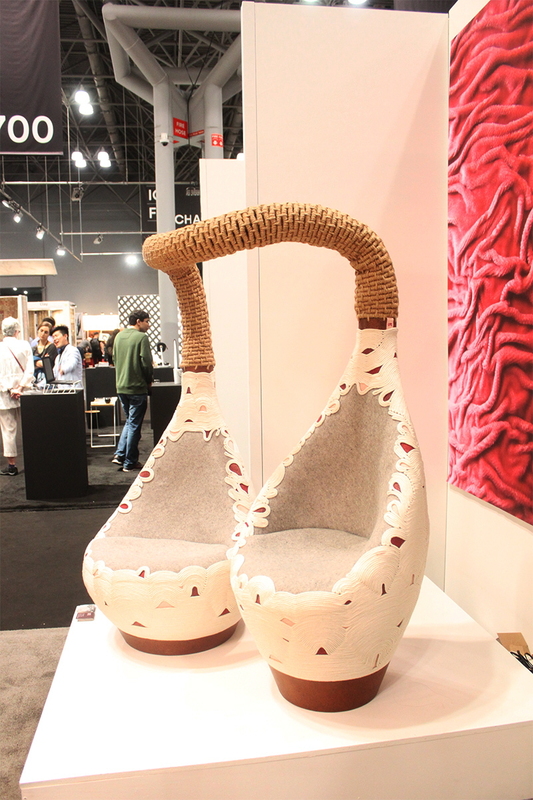 Throughout the month of May, we spotted some of the best student work at ICFF and WantedDesign Manhattan and Brooklyn. Experimenting with materials and technology and tackling real-world scenarios like designing for people with Alzheimer’s, students didn’t hold back their creativity in the least this year. Each show brought with it very different types of student work. 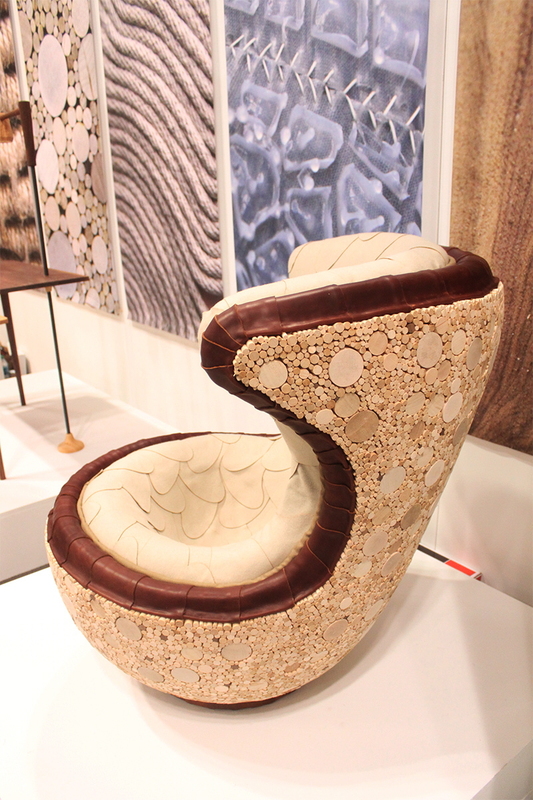 Without surprise, ICFF focused on furniture design, where we saw everything from silicone dipped felt chairs to reimagined prison furniture. 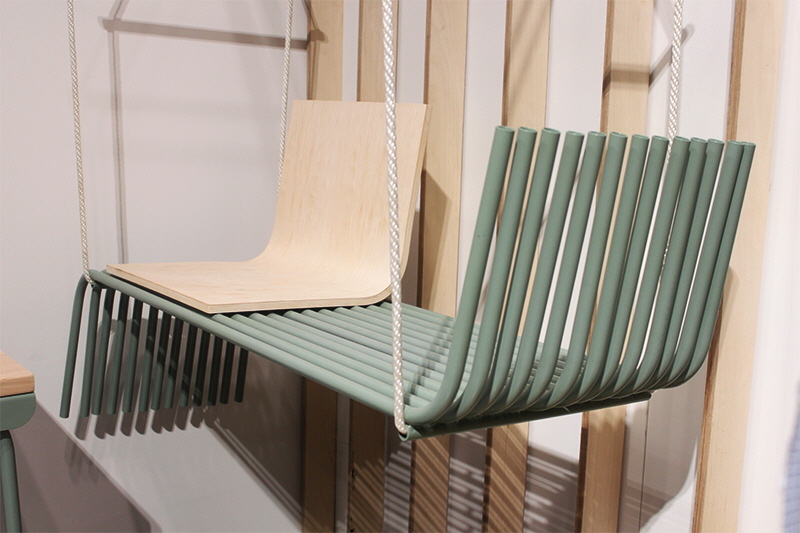 The WantedDesign shows brought more experimental projects to the table, including a hugging chair designed to comfort children with mental challenges like autism. No matter what their medium, material or end goal was, all of these projects here represent the best of the best in up-and-coming design. University of Cincinnati took a holistic approach to their booth, showing metal and wood furniture that could be seen in a dorm, classroom or home environment. 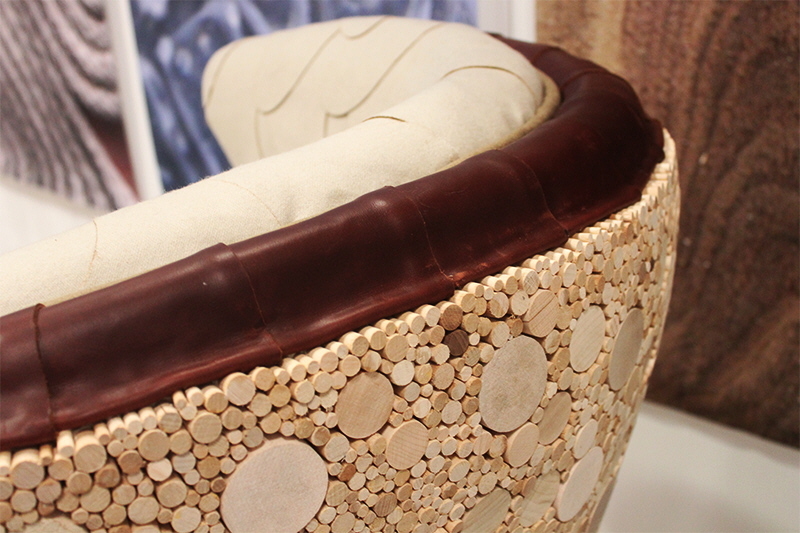 For many undergraduate students involved, this was their first time making furniture. 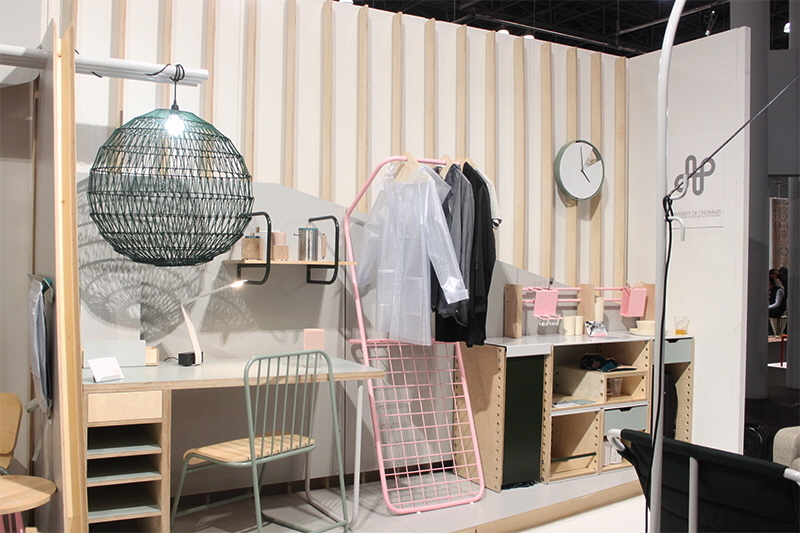 We were impressed with the sophisticated lines we saw, especially with the bench and garment rack. 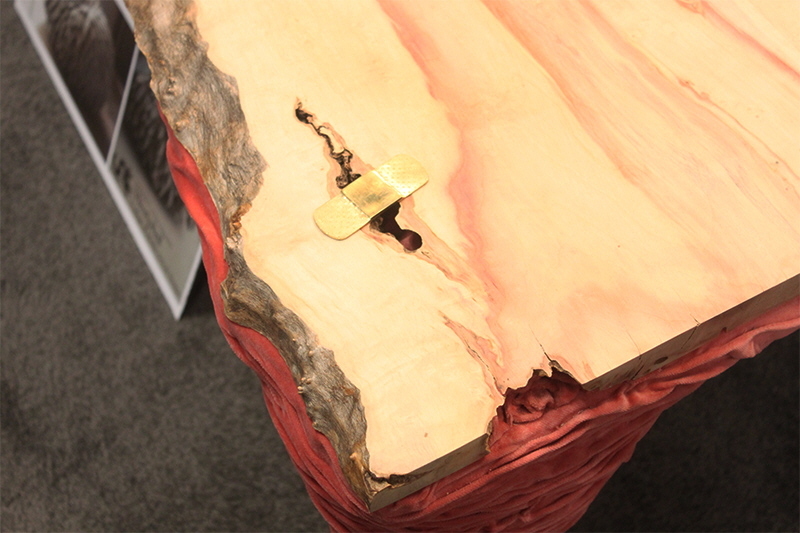 A playful band-aid detail on Carl Durkow’s table at Drexel Product Design’s ICFF booth. Laeticia Mabilais Estevez’s Fig Chairs explore evolving relationships between any two people sitting in the chairs. The cord connecting the chairs isn’t rigid, so the two chairs can be moved closer together or apart based on the two subjects’ relationship at any given moment. 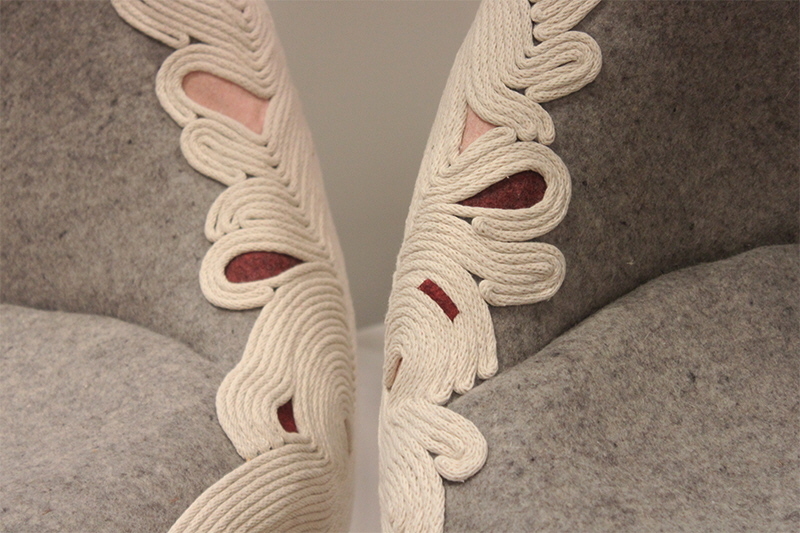 The chairs are made from cotton clothesline, jute cord and wool felt. Each wooden spoke was cut and applied by hand… needless to say, it took awhile to assemble. 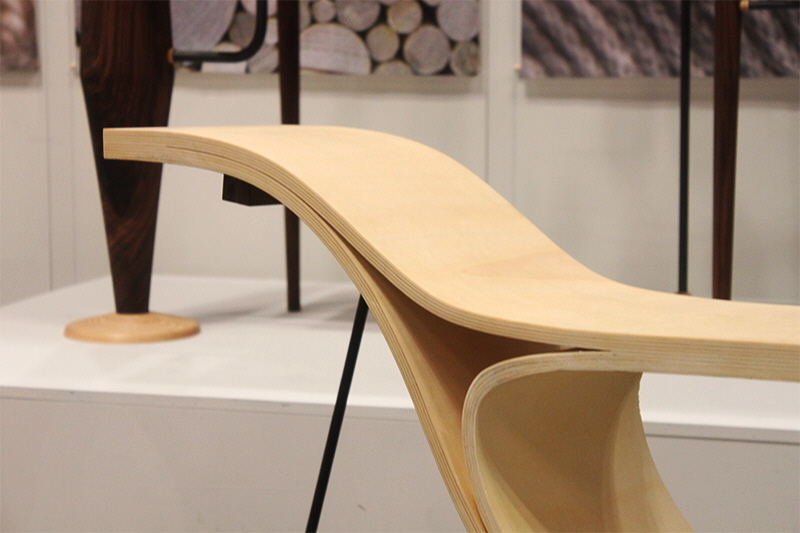 Ignacio de Socarraz-Novoa’sstrikingILAAM Shelf held its own at Drexel Product Design’s ICFF booth. 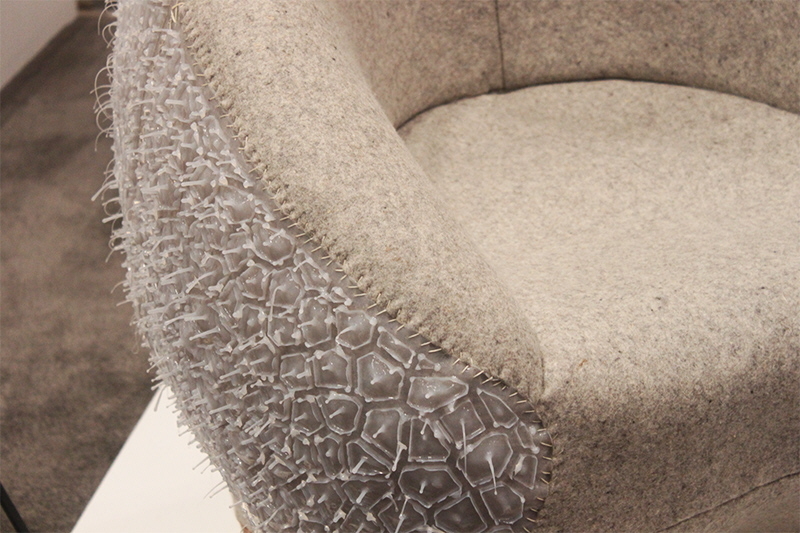 Silicon and felt merge to create this otherworldly chair by Helen Burgess. Before you touch it, you’re not sure what to expect, but when you finally do, it’s hard to keep your hands off of it! For their annual sponsored chair competition that invites students to create furniture using their companies laminate, Wilsonart invited students from San Diego State University to create charis for ICFF under the theme, “Borders, boundaries and mashups” as a celebration of San Diego’s diverse multicultural environment.